Part 2: Memorable Corporate Stunts – What Lessons can we Learn? In 2006, KFC decided that their logo wasn’t big enough and created an 87,000 square foot logo in the Nevada desert – big enough to be seen from space. This was a perfectly timed stunt as Google users were finding their feet in the joys of Google Earth. Finger lickin’ massive. Make sure people can see you! Don’t hide away in the corner. Whether you’re a single offer at a large event or running your own stand-alone event, a great sign can make all the difference. Make it look great and make it visible. In the 1920s the Goodyear Blimp began “dotting the sky over America” to bring the Goodyear name to every possible location. Not only have they worked to get their name ‘out there’ but they’ve worked to become known as a reliable brand. For example, if a customer buys four new Goodyear tyres from a dealer they are entered into a contest to have a ride on the Blimp. If you say you’re going to do something, do it. Nobody would be using the Blimp brand anymore if they didn’t stick to their word. If you promised to attend an event, turn up on time. If you promised you’d follow up from a conversation, do it. Show people they can trust you. US start-up GoldieBlox won over the internet with this video. Produced by CEO and Stanford-educated engineer Debbie Sterling, the video gained attention for its challenge of the perception of girls’ toys and the gender divide in products offered to children. Millions of people shared the video… Despite it becoming the focus of a copyright dispute. Challenge the status quo. Don’t let other people tell you what the audience need. This is your chance to show that you can offer what the audience actually want. Where better to finish than with one of the most iconic corporate stunts ever undertaken? 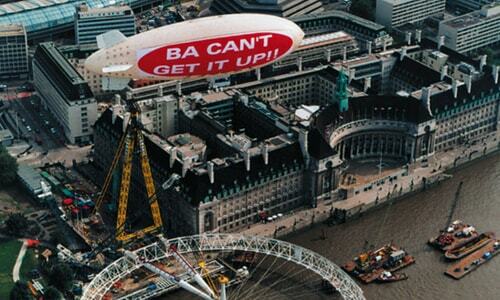 British Airways hit a few technical problems whilst sponsoring the London Eye as they couldn’t raise it into position. Richard Branson reacted instantly. 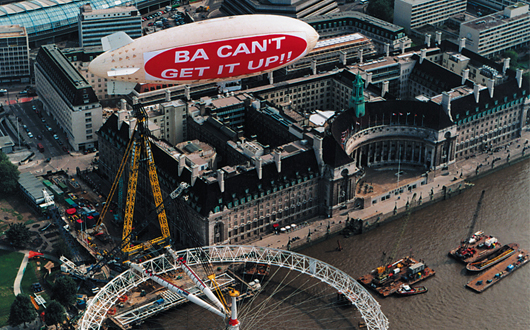 A blimp was scrambled with the iconic slogan ‘BA can’t get it up’, and Branson and Virgin stole the news on what should have been BA’s big day. Be ready to react. Events can be fast-paced affairs with lots of balls to juggle. Respond quickly if things go wrong and always be ready to jump on an opportunity if it presents itself. If you’re really lucky you might not even need a spare blimp to do so. Images from google.co.uk and virgin.com.